Mushroom foraging might seem like a sweet activity, but it can also be quite dangerous. While some mushrooms are delicious, others contain chemicals that can make you seriously sick — and these poisonous varieties aren’t uncommon. Take a walk outside — spring summer or fall — and you’ll likely run into some toxic fungi. Marley said there’s about 40 species of mushrooms in Maine that are commonly collected and eaten, and of those, there are maybe eight or 10 species that are especially popular. On the flip side, there’s about the same number of common toxic mushrooms. And there are plenty of mushrooms for which the toxicity or edibility is unknown, Marley said. For the past 15 years, Marley has served as a volunteer mushroom identification consultant to the Northern New England Poison Center and, at times, the Massachusetts and Rhode Island Poison Control Center. Each year, during mushroom season (late spring through November), he’s contacted on average two or three times a week about potential mushroom poisonings. The majority of the calls are about toddlers who’ve been exposed to mushrooms but don’t get sick. Over the years, he’s learned that people frequently get sick from mushrooms because they mistake them for edible look-alikes or simply don’t have the knowledge to determine it’s poisonous. 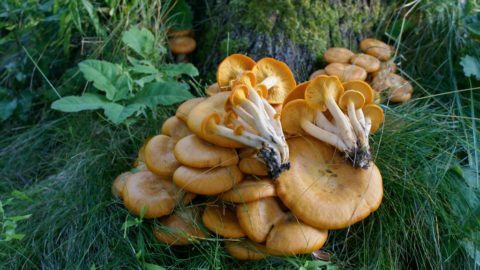 There have also been cases in which travelers forage in Maine and mistake a poisonous mushroom for a similar mushroom that is edible in their home country. Fortunately, the most common kind of mushroom poisoning isn’t serious and causes only temporary gastrointestinal discomfort. Yet, there are some species of fungi that do more damage. And while some mushrooms are fine to eat when cooked, they’re toxic when raw. That’s why it’s important to be 100 percent sure about a mushroom’s identity before eating it, Marley said. With such a foreboding name, it’s no surprise that destroying angel is one of the most toxic mushrooms in the world. 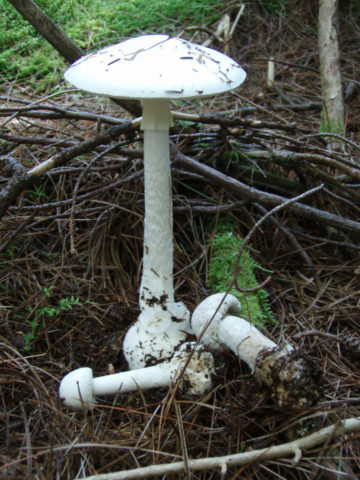 In Maine, this ghostly white mushroom is quite common. Popping up in late summer and fall, the destroying angel contains a toxin that if eaten can be fatal. Fortunately, this large mushroom doesn’t resemble any popular edible mushrooms in Maine. Also known as common earthball, this poisonous mushroom looks similar to the edible puffball mushrooms in that it’s ball-shaped and doesn’t have a stalk or stipe. But there are some major differences between the two that foragers should know. While edible puffballs have a single opening on the top through which spores are dispersed, the poisonous earthball doesn’t. It simply breaks up to release the spores. Also, as the name implies, the outer wall of the pigskin poison puffball is tougher and thicker than that of edible puffballs. While the pigskin poison puffball isn’t nearly as toxic as the destroying angel, it will cause gastrointestinal distress when consumed. Furthermore, for some people, exposure to the mushroom’s spores can cause something similar to an allergic reaction, with sneezing, stuffy nose and irritated eyes. With vibrant orange skin and the ability to glow in the dark, the jack-o’-lantern mushroom has a fitting common name. Often found in clumps on decaying stumps and at the base of hardwood trees, this mushroom has gills that often exhibit a weak green bioluminescence. While these mushrooms are pretty to look at, they’re poisonous to consume, whether raw or cooked, and will typically cause vomiting, cramps and diarrhea. And, unfortunately, they’re sometimes confused with edible chanterelles. Marley said he’s usually contacted about a few poisonings from that mushrooms each year. A large bulbous mushroom in the bolete family, boletus huronensis (sometimes called false king bolete) is a poisonous species that is often misidentified and when consumed can cause painful stomach issues for hours. 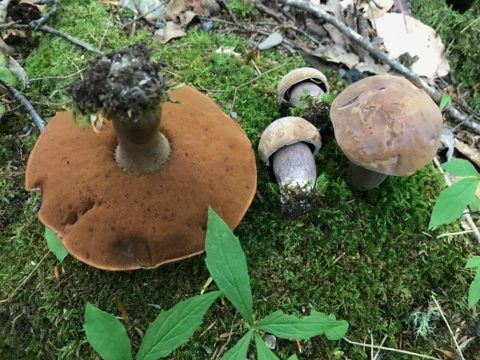 This mushroom has snuck up on people because in some areas, it’s considered edible, while in Maine it has made people very sick, Marley said. 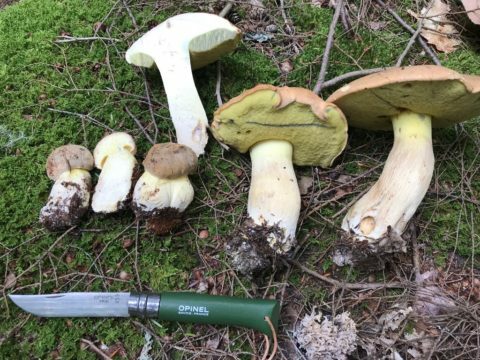 This year, Marley has received report of a couple poisonings by this mushroom, so he’s currently working to get more educational material out into the public about the toxicity of this mushroom and its relative, boletus huronensis. 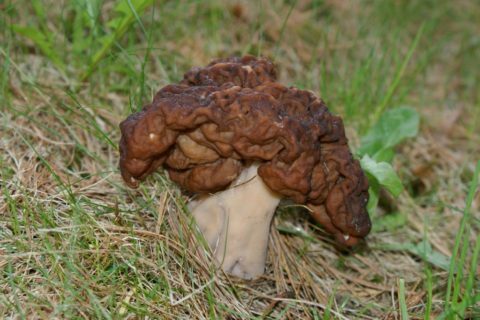 The term “false morel” describes a few species of mushrooms that contain a chemical found in certain rocket fuels, and to humans, this is a toxin that can cause dizziness, vomiting and, in some cases, death. 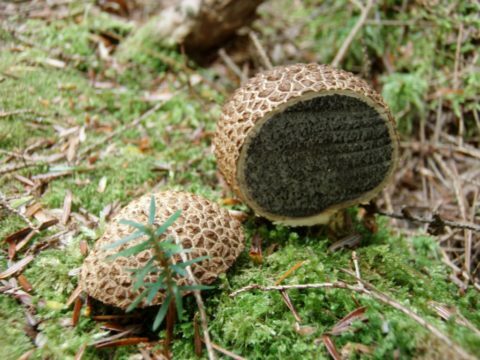 With a squishy, brain-like appearance, they resemble true morels, which are popular edibles. This article is meant to raise awareness and should not be used to identify mushrooms. If interested in learning about mushrooms identification in Maine, Marley will be leading a mushroom identification workshop on Saturday, at Merryspring Nature Center in Camden, and another on Sept. 29, hosted by the Damariscotta River Association. You can also check out Marley’s book “Chanterelle Dreams and Amanita Nightmares: The Love, Lore, and Mystique of Mushrooms,” which highlights edible and poisonous mushrooms. If you’re concerned you may have ingested a poisonous mushroom, call the Northern New England Poison Center at 800-222-1222.